They argued that companies couldn’t really dominate in more than one. None of these are exactly optional, but their research suggested that companies should focus on truly mastering just one of the domains and partnering or subcontracting with others in the areas where they couldn’t dominate. A few years later, John Hagel and Marc Singer from McKinsey & Company came to a similar conclusion in their Harvard Business Review piece Unbundling the Corporation. They even used very similar wording (Customer Relationship Management, Product Innovation and Infrastructure Management) to describe the domains. The chart below combines the two concepts to show just how similar they are (Treacy and Wiersema are in blue text). They both suggest kind of a Strengths Based Leadership approach for companies– improve your weaknesses enough to prevent failure, but the focus on your strengths to achieve greatness. So, what kind of business is banking? Some banks may indeed stay in the infrastructure management business, and even double down on the strategy. The basic machinery of banking actually works pretty well. Even in the fading hangover from the global financial crisis, trillions of financial transactions are made every year with astounding speed and accuracy. I recently retweeted my recent post “From Transactions to Relationships: Innovation’s Next Horizon”, where I argued that banks are in the relationship management business; and I received a great response from Yann Ranchere, Finance Director of Anthemis Group, and publisher of the Tekfin blog, which is on my regular reading list. In response to my tweet, Ranchere asked why becoming a dumb pipe was such a bad outcome, and he sent me a link to a post he had written in 2011 “Banking as a platform – what retail banking can learn from investment banking”. 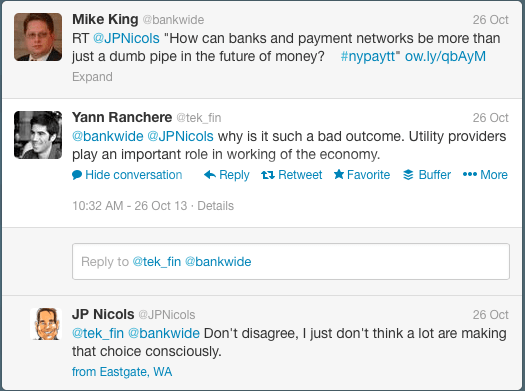 I replied that I didn’t disagree; I just didn’t think that a lot of banks were making that choice consciously. Ranchere added that banks have infrastructure management in their DNA, (which is of course true), and I replied about the relative unattractiveness of utilities compared to consumer product/service companies, especially because the industry will only support so many utilities. Ranchere is absolutely correct. Banks do have this in their DNA, and some will be very successful at this. Think about State Street or The Bancorp, or even tiny CBW Bank in Weir, Kansas, the bank behind Moven. The problem is that the necessity to drive down costs and gain economies of scale mean that there will be only a few winners with this strategy. I would argue that very few banks to date have taken a product innovation approach, and I doubt that more than a handful are truly capable of being true innovation leaders. At least not in the same vein as Mint, PayPal, Square, Moven and other poster children for financial innovation. This is not to say that banks and other financial institutions shouldn’t innovate. I spend a significant part of my life advocating, encouraging, preaching and cajoling bank leaders to place a higher priority on innovation. It’s just that most cannot expect to create and commercialize the majority of new innovative products and services from within their own four walls. They absolutely should be innovating early and often, but with a much broader perspective that is more inclusive of outside partners. To effectively innovate new products and solutions, banks need to partner with FinTech companies, and even with each other. There is massive duplication of efforts in the industry. Bankers are inherently risk-avoidant. At best they’re risk managers. Bankers have to be right 99% of the time in lending decisions, but innovation is about taking risks and failing and learning from those risks until you get it right. The key is to fail fast and fail cheaply, and fail in an environment that is firewalled from impacting customers or shareholders. I believe that more banks can win with a Customer Relationship Management strategy, but only if they actually run the business that way. Most bankers would probably argue that they have always been in the customer relationship management business, but if we’re honest about the activities that get the most energy and attention in the industry, it really seems that most have taken an Infrastructure Management approach (I know, I know… the regulations rather reinforce that…). A few big players dominate… Check. Stresses standardization, predictability and efficiency…Check. A Customer Relationship Management approach is about economies of scope— expanding the share of wallet, in industry terms. Sure, we pay lip service to that, but it’s the customer-comes-first mentality where we usually drop the ball. And that’s where the industry is most vulnerable to nimble start-ups that design everything around the customer experience.